It may have been a bad night for fans of the Real Madrid Football Club but for fans of the basketball arm of the organisation, Sunday the 17th of May will go down in history. 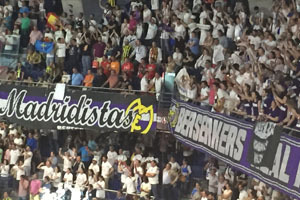 The football side lost out in the title race to Catalan rivals Barcelona but in Madrid, the basketball side took advantage of home-court advantage in the Final Four. 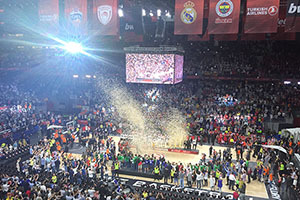 When it was announced that Madrid was going to be the host city for the 2015 Final Four, hopes were high that Los Blancos would triumph but when you think about the number of near misses that this Real Madrid has been involved in over the years, it is easy to see why many fans preferred to remain cautious about the outcome of the tournament. That caution was put aside at the end of the game though and the 78-59 final score showed how dominant Madrid were in the end. The game was tough for Madrid at the start, Olympiacos raced into a lead in the first quarter, they were 15-19 up at this point but a strong showing in the second quarter gave the home teams plenty to shout about, and Real Madrid were in the lead by 35-28 at half-time. There was stalemate in the third quarter with both teams scoring 18 points each and in the final quarter, Real Madrid raced away, scoring 25 points to their Greek opponents 13, giving them a commanding margin of victory at the end of the game. The roars of the home crowd in the Barclaycard Center were heard throughout Madrid, signalling the lengthy Euroleague drought that the club had endured. This year there are plenty of 20th anniversary celebrations of the bands that ruled in the Britpop era but for the basketball arm of Real Madrid, this year is all about lifting the Euroleague title, minimising the need to focus on the 20th anniversary of their previous Euroleague title. On that occasion, Olympiacos were the losing side as well, even though the Greek side have enjoyed a number of triumphs over their Spanish rivals in recent years. The 1995 final was held in Zaragoza, so now the next task for Real Madrid is to win the trophy outside of Spain. With the 2016 Final Four being held in Berlin, they will have an early chance to do so! This win capped a Real Madrid double on the day as the Under 18 squad lifted the Adidas Next Generation trophy at lunchtime. The juniors win wouldn’t have provided much comfort if the main team had lost out but the fact that there was a double cause for celebration for Real Madrid made this night a very sweet one for the basketball fans in the capital city of Spain. Earlier on in the day, CSKA Moscow showed that they had the bottle to bounce back from a harsh defeat in their semi-final match by overcoming Fenerbahce Ulker Istanbul by a score of 80-86. The Russian side looked the best team in the regular season and in the Top 16 but they fell short when they came to Madrid. It was Olympaicos Piraeus that toppled the Russian side in the semi-final but in the end, it was the team from the Spanish capital that prevailed, leaving Real Madrid as the 2014/15 Euroleague champions!